All machines are precalibrated in factory. For most of the time, users don't need to re-calibrate your printer. 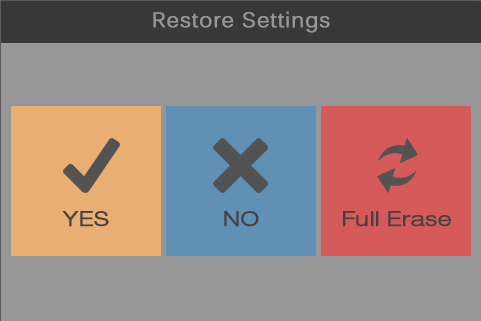 But if EEPROM information are modified, and user want to reset to factory state, please use “Restore settings” menu and choose “YES” to reset settings. WARNING: Choosing “Full Erase” will completely delete all settings. If need to use dual-print, need to calibrate dual-extruder distance again. DO NOT CHOOSE “Full Erase” UNLESS YOU KNOW WHAT YOU ARE DOING.